Every year at Mossy Alfa Romeo, we see vehicles that have been damaged by rodents of some sort. 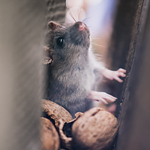 Whether it's mice, rats, squirrels or some other animal, the damage can be costly. Pay us a visit and allow us to offer some products or tips that can help eliminate rodent damage to your vehicle. The first step you can take to eliminate rodent damage is to eliminate the rodents. If you park in a garage, make sure there is no food, like dog or cat food, near the vehicle. Weather permitting, you can leave the hood open. Setting humane animal traps on top of the tires or bumper can also be helpful. Using deterrent spray or tape has also helped many drivers get rid of rodents. If you’ve already been a victim of rodent damage to your vehicle, come to our dealership and allow us to service your vehicle. Many of the damages may be covered by your comprehensive insurance.